There is not a lot of LE “tribute to” of radiomir cases. 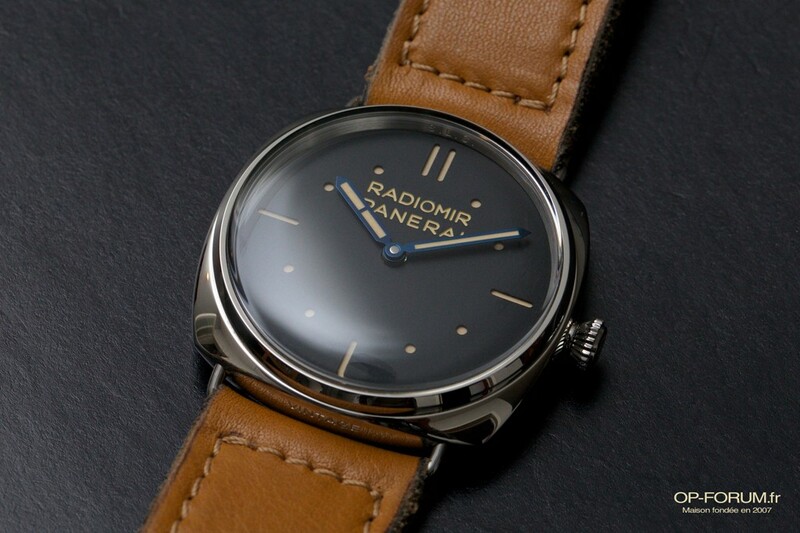 Except for, PAM 21 in 1997 only 232 and 249, tribute to the famous vintage 3646, have been proposed by Panerai in 2006. 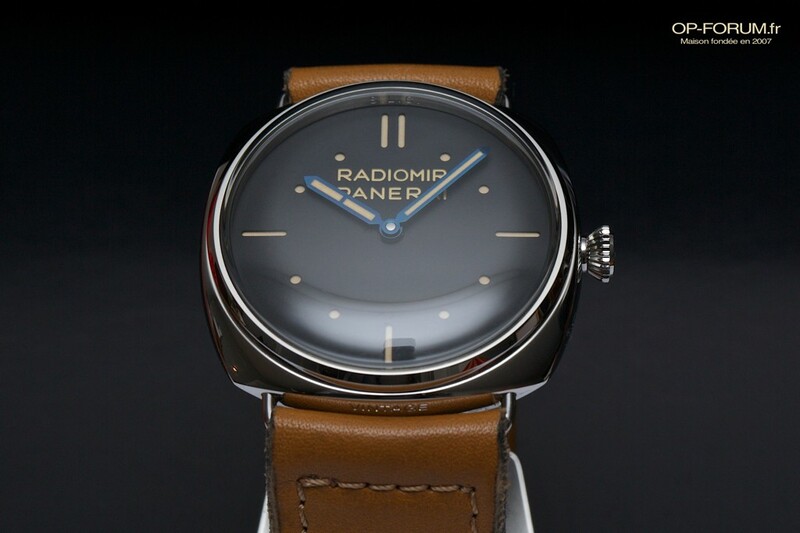 Despite the vintage trend started by PANERAI since several years, the 2533 dial has not been reused a lot. 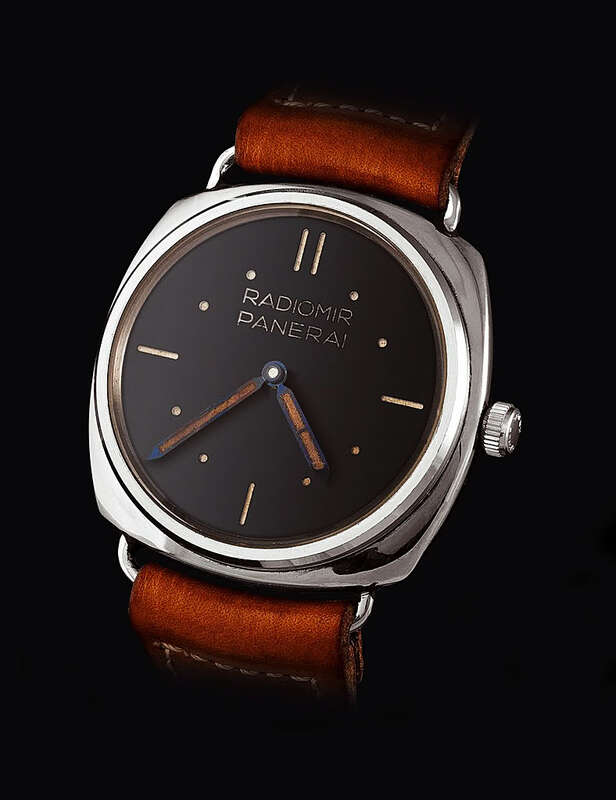 In 2011 on the platinium PAM 373 (LE 300ex), and 2012 on the PAM425, this dial was a kind of inspiration for the dial of Luminor Submersible 1950 PAM 305 then for the 382 and recently for all Sub revealed during 2013 SIHH. The Radiomir S.L.C. 3 days PAM449 is produced in 750 units. Price in Panerai french shops is 6 600€. First samples was delivered by the end of 2012. The huge LE box in pear (compared to standard boxes). The specific LE parchment which mention the reference model and serial number of the case (on 750). Made of polished steel AISI316L, the case in a typical Radiomir cushion shape with removable wire loop strap attachments, and screw-down winding crown with OP logo. 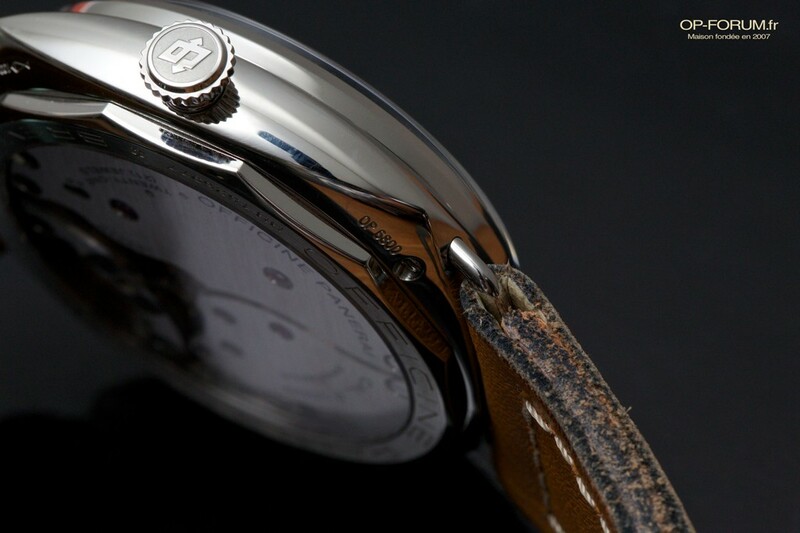 The “S.L.C.” engraved inside at 12 o’clock is very discreet compared to the “California” , its twin the PAM 448. 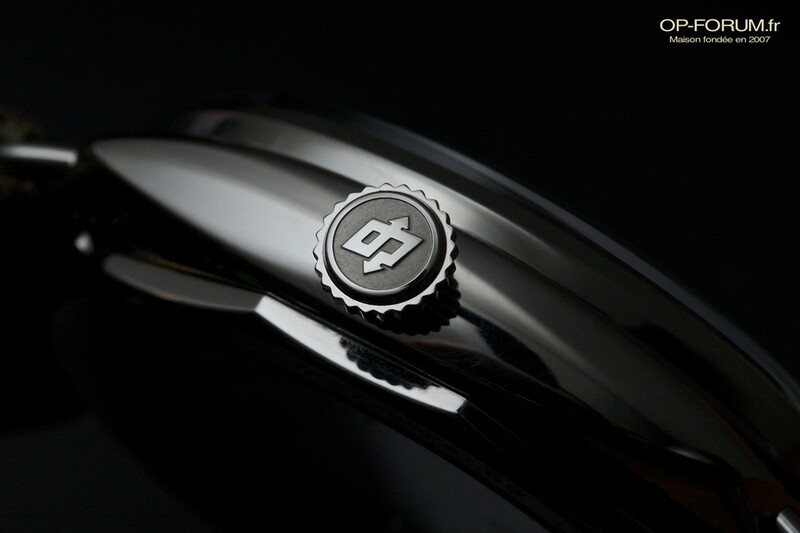 The diamond’s shape winding crown is strucked with the official arrows OP logo (see more details about logo HERE). Nevertheless, I think it’s a pity it was not build with the same crown of PAM 399, closest to the prototype. 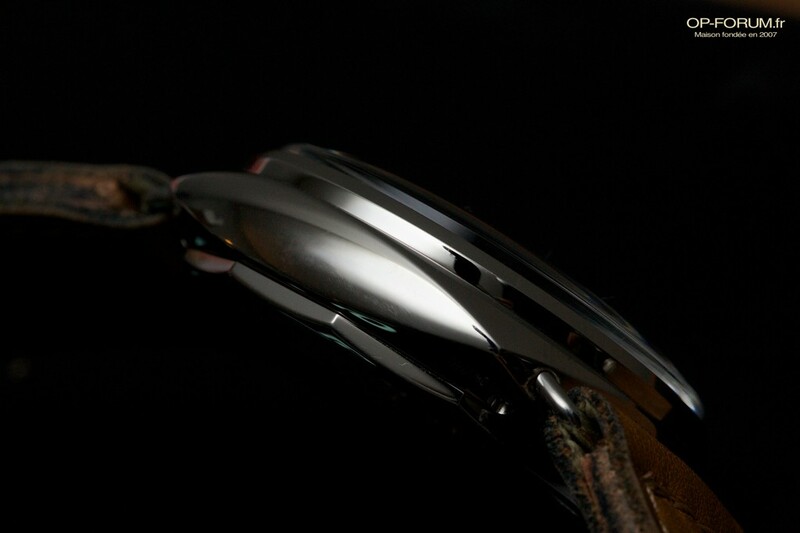 The back is a see-through sapphire which allows you to admire the impressive homemade movement P.3000. In one word Amaaaaaziinnnnnggg !!!! Faithfull to the original, the black dial is a “sandwich” one. As you know, this dial with openwork round and straight indexes is placed above a luminova “old tritium like” dial. Really pure, it consist of only four straight indexes instead of traditional 3-6-9-12, and 8 rounds for others clocks. The blue needles, identical to the 2533 are really wonderful and fit completely with dial and indexes. Remaining in the original spirit (the cristal of 2533 was made of methyl polymethacrylate), the glass is a plexiglass®, not a “dome” like on the 249, but a “fireplace”. 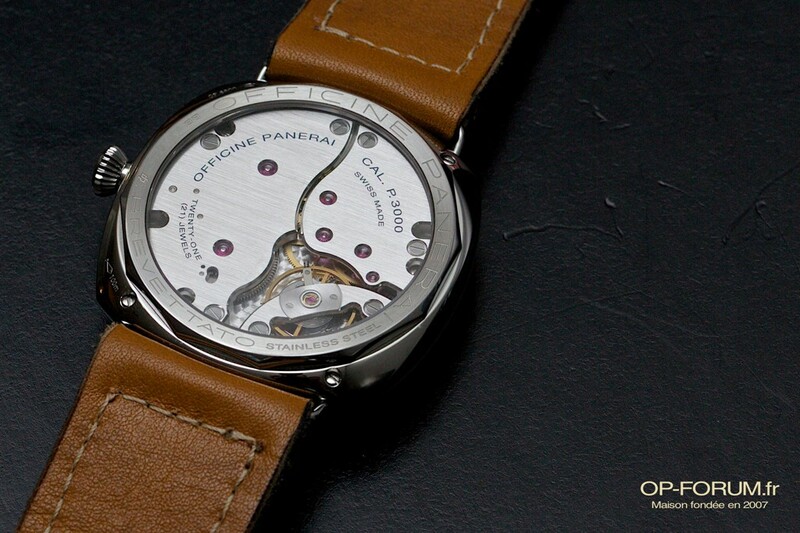 Like on most Panerai 47mm case designed since 2 years, the 449 is mounted with the home made P.3000 calibre. Entirely executed by Officine Panerai , and produced in Neuchatel, the hand wound calibre P.3000 fulfills all attributs of Panerai movements, such as robustness, preciseness or power reserve. Like on all Radiomir, the 449 is delivered with only one strap and without screw driver. This is a “Ranger Radiomir” made with brown leather and beige sewing. That’s why I decided to change it for a “Distefano” which enforces the 2533 spirit. Do I really have to find one ? The crown is different from the prototype. 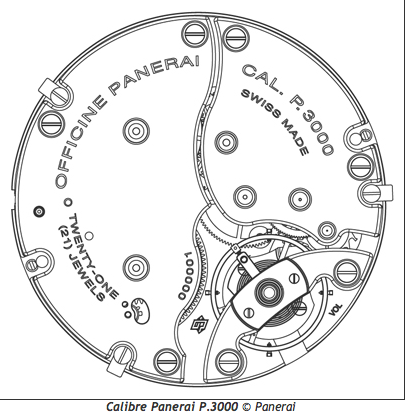 Panerai purposes us an out of this world watch, a tribute to Panerai basis end in. This PAM 449 S.L.C. 3days will become a must have, it represents all knowledge of OP, perfect mix between OP traditions and modernity. 449 have a real personality, masculinity, sensuality, with an octogenarian design, and so a timeless Radiomir. This Rad cannot be overlooked, it’s the key Rad. For me, my growing knowledge of OP has changed my horology taste, guiding them to simplicity. The 372 has been a step, a path to the 2 needles dial pure world. This 449 is a real uppercut and cause me an amazing sensation, it’s with me for a long time and I’ll be glad to pass down, one day maybe.